The velociraptors are trying to get out again. I’ve rigged up their enclosure with electric fencing but the devious creatures have come up with a plan. It’s not a clever one but it has me worried: they’re ramming the fences. Every time one of them headbutts the cable it is blown back with the force of the shock, dazed. But each hit is putting strain on my power plants. After the seventh hit the power cuts out. Not just to the fences around the velociraptor enclosure, but across the entire park. And, like that, as though with a flick of a switch, my park feels like it could be the setting of a Steven Spielberg film. The raptors break through the fence and out into the park. They immediately spread out and start attacking my guests. That’s bad enough, but I’m worried about something else. It wasn’t just velociraptors in that enclosure. 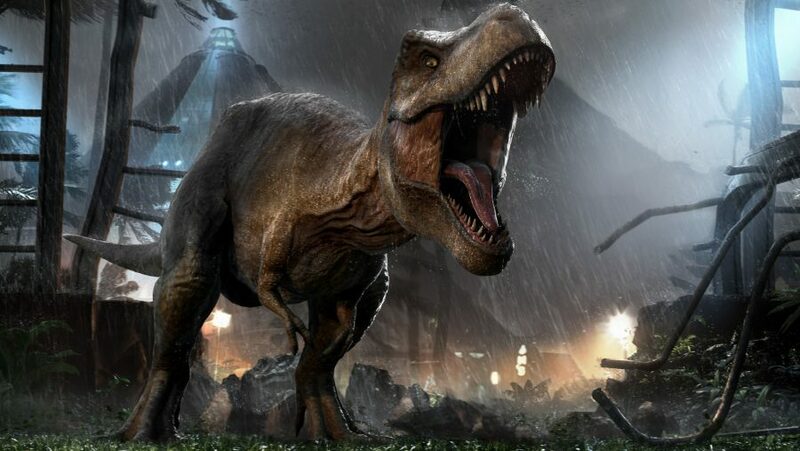 Before I can even call in the ACU team to tranquilise it, the T-rex has followed the raptors out into the park and is guzzling down tourists like someone challenged to eat oysters without using their hands. 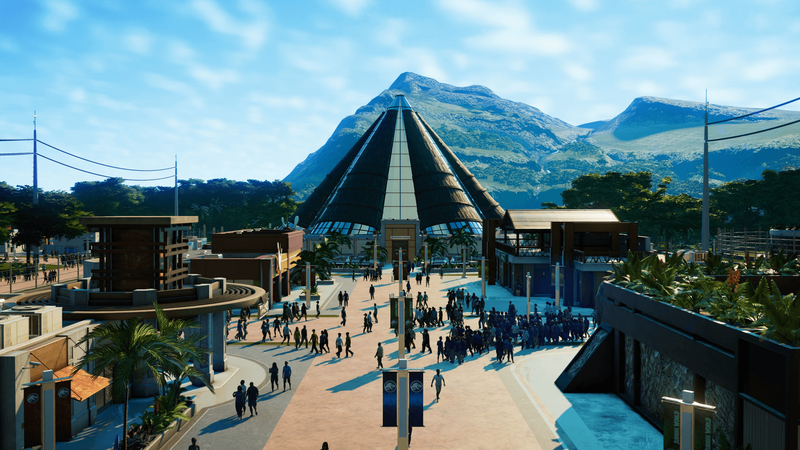 Jurassic World Evolution may be a management game, but it has all the action of a Jurassic Park movie, albeit viewed from a safer perspective. The joy of management games often comes from constructing a profit-making assembly – optimising a set of components, be it the parts of a mineral refinery, the machine floor of a car factory, or even the interior of a private hospital. You make sure everything that should be together is, cutting out any wasted travel time for your employees. You ratchet the price up on your products so they’re as expensive as they can be without impacting sales. And you stop serving the customers that cannot afford your most lucrative services. You’re rewarded for being ruthless. You go to all the trouble of building an enclosure for your genetically engineered dinosaurs and then they go and spoil it all by eating each other. Here's how to stuff an enclosure to the rafters with herbivores and carnivores and make them good neighbours. Yet, something about the dinosaurs at the heart of Jurassic World Evolution is getting in the way of my profiteering. I find myself halting the camera as I’m panning across the park and just watching the creatures in their enclosures. Sometimes you’ll see a pack of struthiomimus huddled together socialising. You can bring the camera in close and hear their squawked conversation. And I’ve yet to have a time when I’ve not stopped to watch the carnivores hunt a goat – they’ll chase down the white-haired mammal in seconds. It’s a grisly but fascinating sight. Frontier Developments has filled these digital creatures with distinctive life. It’s obvious from the moment they step out of the Hammond Creation Lab and into your park. The great doors creak open and the dinosaur emerges from a leafy enclosure. The small, lithe struthiomimus bursts out of the brush, stretching back its head and letting out a shrill shriek. The triceratops lumbers out with a shake of its great horned head, opening its beakish mouth wide in a low call. And the T-rex steps into the world with all the confidence of a king. It swings its head from left to right, looking about its kingdom, and then lets out the great bellowing roar, echoing itself from the films. Rightly, much of the game is built around developing and caring for these creatures. You send expeditions out to dig sites around the world in search of fossils that can be analysed for scraps of DNA in the Fossil Centre. When you’ve harvested enough data then you can begin incubating new species of dinosaur in the Creation Lab. In your research centre you can discover new ways to splice animal DNA into your dinosaurs, changing the skin colour or fostering different traits – such as lifespan, resilience to disease, and aggressiveness in combat. Many of these traits can also raise the profile of your dinosaurs, drawing larger crowds to come see them. You also need to research cures for diseases so that if your dinosaurs fall ill your rangers can inoculate them before it spreads to too many of your animals. You can task the AI to handle this for you, or take direct control of the rangers and fire the darts loaded with medicine into the dinosaurs yourself. Of course, you aren’t running a nature reserve, but a theme park. You must also build viewing platforms so your guests can see the dinosaurs they’ve paid to visit. And you have to satisfy their other needs, too, building hotels, restaurants, and gift shops around the five islands Jurassic World Evolution’s campaign is spread across. 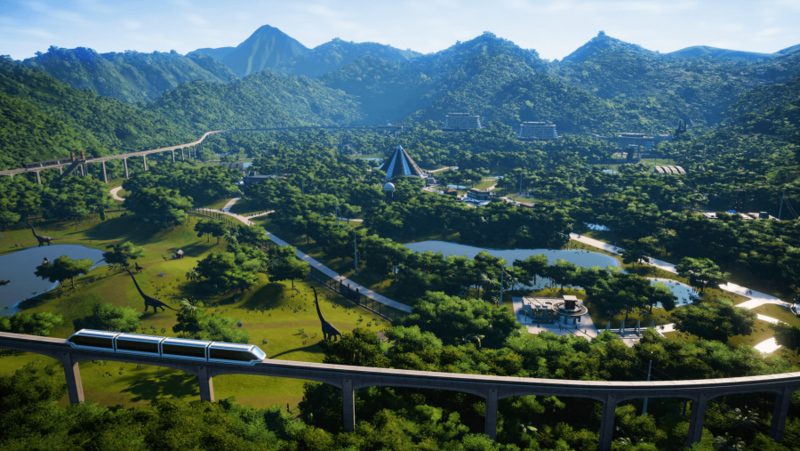 This side of Jurassic World Evolution is where the game is weakest. While the need for concessions stalls for your guests is clear, the formulas behind them are less obvious. I’ve had parks full of visitors where the shops’ UI tells me they receive no customers. I can fiddle with the shop’s management through a menu – changing what quality of item they sell, for how much they sell it, and even change the management style of the establishment – but the impact those changes will have on the park is not apparent. You aren’t able to see into the minds of the visitors either, so their reasons for spurning the fast food shop’s Dino Feasts are a mystery. Thankfully the dino’s brains are more accessible. You can click on any of your dinosaurs to access a menu showing their comfort, and a set of sliders showing what is causing them upset. Your Brachiosaurus, for instance, will become unhappy if there aren’t enough trees in its enclosure. 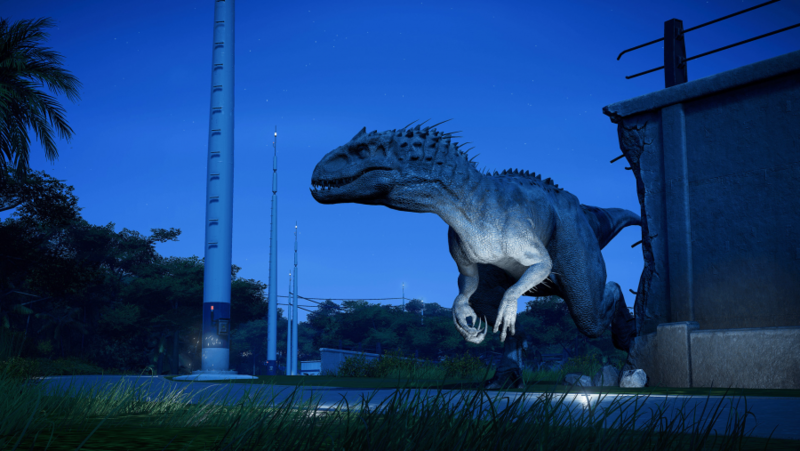 The Ceratosaurus doesn’t like company, and so if you have more than two of them in a single enclosure will become agitated – increasing the chance it will try and break out into the park. 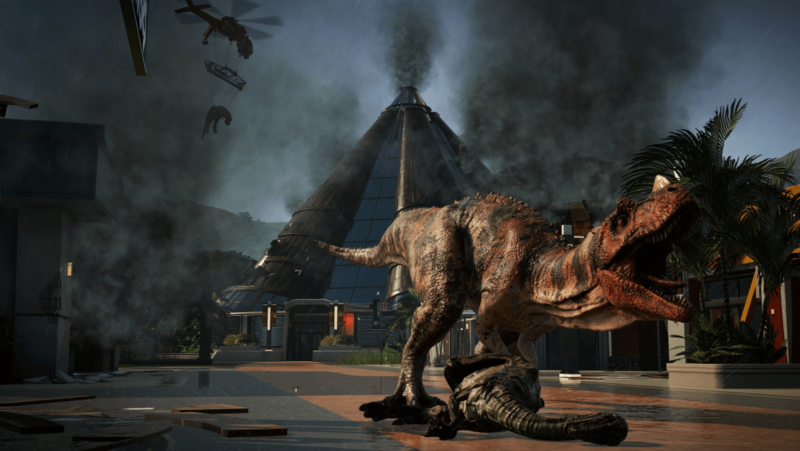 Balancing the desires and dislikes of your dinosaurs is the appealing puzzle of Jurassic World Evolution. Filling your enclosures is like populating an aquarium with tropical fish. And if you pay attention to every dinosaur’s needs, you can cram a load of them into a single pen and keep them all happy. It’s a system that encourages experimentation, too, since it can be surprising which dinosaurs are happy to share a space with one another. My Brachiosaurus couldn’t stand living with Velociraptors. They were terrified of the small carnivores, so much so they wouldn’t go to eat or drink if the predators were nearby. The Diplodocus, however, which look as though they would have the exact same problem as the Brachiosaurus, were completely fine to share an enclosure with the raptors. Everything about the dinosaurs is a joy, as it should be in a Jurassic World game, but it makes the weakness of the park management layer plain. The disparity between managing the dinosaurs and managing your guests is all the more apparent because Frontier made the excellent Planet Coaster. In that game the wants and needs of your guests are so much more accessible and addressable. Though it’s telling of how compelling the dinosaurs are that I had been playing for hours before I realised none of the park’s visitors had been visiting my shops. There is a kind of magic to seeing such familiar yet alien creatures move, behave, and interact as though they had been observed in the wild. And it also speaks to the focus of the game that I was able to unlock all the islands and missions without solving the puzzle of my park’s patrons. If anything I took on the role of a benevolent eccentric, building a park and bringing long-dead creatures back to life for my own pleasure and fascination, not to gouge the wallets of the people drawn to the creatures I was so captured by. Basically, what I’m getting at is that Jurassic World Evolution made me into John Hammond. 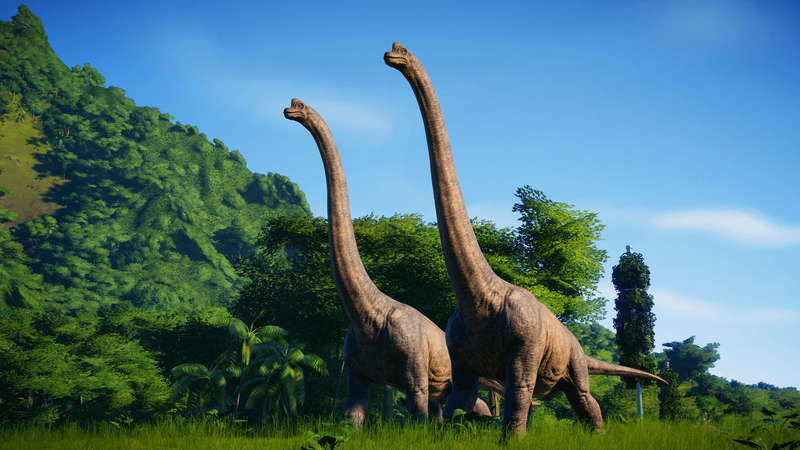 What Jurassic World Evolution lacks in complex management systems, it makes up for in the sheer magical joy of giving you a toy box of living, breathing dinosaurs.